Every 25 to 50 years since 1300, the Catholic Church has called a jubilee year for the faithful to focus on reconciliation and solidarity. Even more infrequent are special jubilee years, which Pope Francis opened Dec. 8, 2015. The Extraordinary Year of Mercy ended Nov. 20, with a closing Mass at the Vatican, and Trevor Carolan ’11, as a member of the Basilica of Saint Mary’s Schola Cantorum, was asked to sing at the event. “Pope Francis has been revolutionary in the Catholic Church in terms of outreach to the poor, prisoners, and the needy. He talks about the need for all of us to focus on mercy, not only through prayer, but also through outreach and action, and this jubilee year was a way for us to focus on this,” Carolan said. Carolan believes the Minneapolis-based basilica’s choir was chosen for this honor, in part, because it was the first U.S. church to be elevated to the rank of a basilica. Shortly before leaving for Rome, Pope Francis announced he would hold a consistory in conjunction with the closing of the special jubilee year. The Schola Cantorum also was asked to sing for this ceremony. At the jubilee closing, Carolan’s choir sang with the Sistine Chapel Choir, which sings for all major papal Masses, as well as other specially selected choirs from around the world. 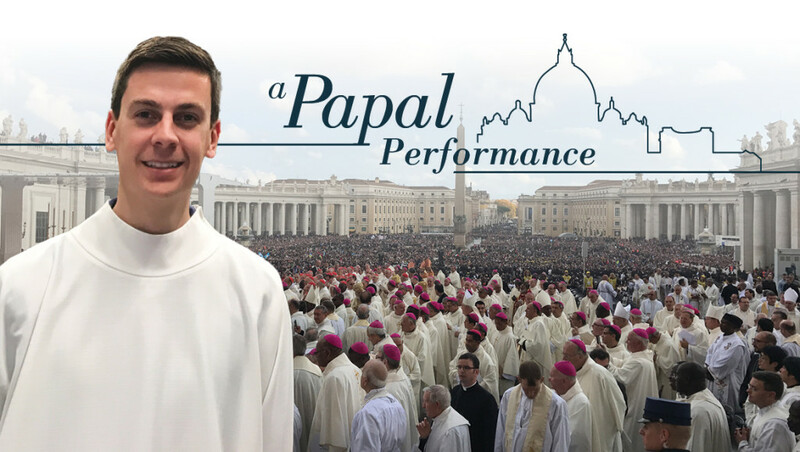 “While it has been a lifelong dream of mine to sing for a papal Mass at the Vatican, there are other reasons that make this trip more significant,” Carolan said. While the venue and events may have been extraordinary, performing overseas was nothing new for Carolan, who was a member of the Wartburg Choir. “The opportunity to travel abroad twice with the Wartburg Choir included some of my greatest memories as a Wartburg student,” Carolan said. He also studied organ with Dr. Karen Black, the Rudi Inselmann Professor in Organ. “Trevor’s passion for music has always been evident. Even though he wasn’t a music major, one would often find him practicing in the music building or on the organ in the chapel,” said Lee Nelson, Wartburg Choir director. Nelson also remembers Carolan, who was student body president during his senior year, studying for his LSAT while hiding from students on Outfly as part of the longstanding tradition where students try to find the president. Carolan passed the test, went on to law school at the University of St. Thomas, and is now a judicial law clerk for a federal judge in Minneapolis. Though a lifelong Catholic, he was happy to see the Lutheran Church get a special nod during one of the pope’s Masses.